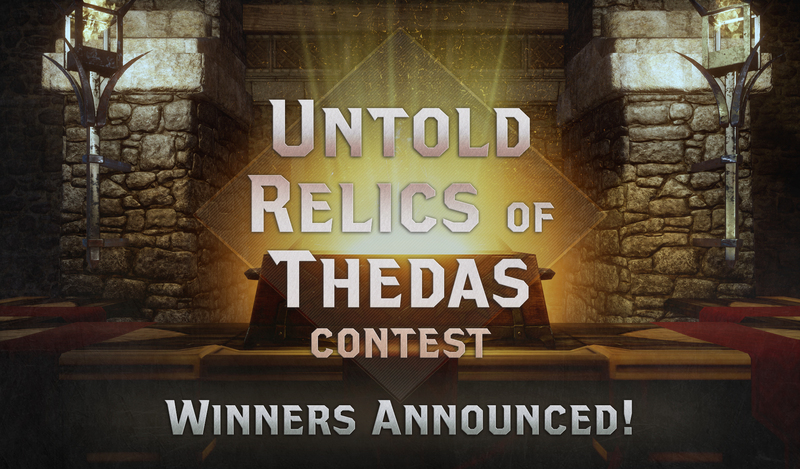 In just five short days we received hundreds of entries for our “Untold Relics of Thedas” contest. Among the many wonderful trinkets, trifles, and rare antiquities, four stood out. Each winning entry was chosen for the unique flavor it brought to gameplay, and its potential for encouraging new builds and playstyles with greater risks and rewards. We present to you the winning items, along with some of the backstories our winners provided. Description: This crude, yet distinctive amulet was originally “created” by Regsith, a dwarven warrior not long after the original darkspawn incursions against the dwarven kingdoms. She and her sister, Malika, were members of the Warrior Caste who had developed a pair of different, yet complementary fighting styles that made them impressively effective. They would both charge into the thick of combat for a full frontal assault. Malika, with her polished inlaid axe, massive armor, and equally large shield would strike their target screaming and cursing. Lightly armored and swift Regsith, on the other hand, would slip in under their now-distracted target’s guard and quite literally eviscerate them, eschewing the more common backstab for precise slashes to the belly. Before battle, Malika would call out to her sister, “I’ll grab ’em,” who would respond in turn, “and I’ll gut ‘em.” Their team-up fighting style (and the fact that Regsith was quite terrible at any sort of stealth or subtlety needed for a scouting unit) ensured that they were always assigned to the same unit, proving their worth in engagement after engagement. Eventually, the sisters separated, as Malika felt she wasn’t doing enough against the ever-encroaching darkspawn and volunteered for a special assignment under the Paragon Caridin. Regsith was distraught over this, but eventually bonded with a new golem assigned to their unit, who she called Malika in memory of her departed sister. * Malika the golem used techniques similar to those of Malika of the flesh, albeit altered to benefit from its increased size and resilience. The pair performed as well as ever. Eventually, while on patrol, Regsith’s unit was ambushed by darkspawn and Malika overwhelmed. Seeing her surrogate sister killed, Regsith lashed out at the golem’s killers and tore off a shard from Malika before beating her retreat. Despondent, she hung the shard around her neck with a piece of rough leather cord, and crudely etched upon it with her dagger, “Malika: I’ll keep gutting if you keep grabbing.” After a week alone in the Deep Roads, she returned to the dwarven army and, after some basic treatment from the medics, insisted they send her back out into the thick of it. Seeing as she would otherwise just run off and be killed by a random darkspawn patrol in her pursuit of vengeance, they assigned her to a new unit and hoped this way she would at least kill a few more darkspawn before going down. Instead of scouting or sneaking around, Regsith resumed her standard method of full frontal attack, this time without her partner. However, she did not die—her targets always seemed distracted somehow, giving her an opening. This surprised her comrades, to say the least, and stories came to surround her distinctive necklace with its roughly shaped, yet eerily iridescent pendant. When she eventually died (due to blight sickness or an enemy’s blow, depending on the storyteller), her unit took the necklace and gave it to the next unstable rogue assigned to them. And it still worked. *Yes, Malika did volunteer to become a golem with the special request that she be assigned back to Regsith’s unit so she could continue fighting alongside her sister. Backstory: Inquisition scouts found this amulet in a burned-down chantry. A miracle that it was found at all, really: it was buried under fallen rafters and covered in ash. It could be that some brand of magic led them to it. All those who’ve held it have felt something strange in it. Like it’s taking all the mana in the air and bending it. The scouts gave it to a mage to see what she made of it; she said it felt like all the power in the world. Funnily enough, immediately afterwards the company was set upon by wild dogs, and every animal went after the mage. Could be some kind of curse on it, but whatever it was, it made her terrifying to watch. You are a deadly threat to any enemy that can’t see you coming. When you attack from stealth, you automatically land a critical hit. Backstory: Created by a young Tevinter magister who was forced to wed to a woman with whom he was not enamored. The young magister cleverly enchanted his wedding ring with the power of invisibility, planning to slip away unnoticed as soon as the ring slipped on his finger. Unfortunately, the enchantment spell went awry and doubt of his very existence soon spread. Cursed with fat fingers, the mage was forced to live as a faint shadow of a person. He spent the last of his days pushing books off of cabinets and tripping people to prove his own existence. Resist a lethal strike once every 60 seconds. Backstory: Honnleath is overrun with darkspawn. A little girl watches through a crack in the front door as genlocks gut the butcher’s husband. She’s holding her breath and hoping she won’t be next, and maybe she won’t, because now the butcher turns her cleaver on the horde. She is strong and fast with the blade, knows just where to part each bone from its joint. The genlocks fall, one after another, and the little girl remembers to breathe. But then an ogre crests the hill, and the butcher is torn in two. Amalia can’t stop from screaming, and fear builds fire in her palms. It doesn’t burn, yet it’s burning, flames flying through the only home she’s ever known, turning all to ash, and she knows she has to run, but it’s chaos. Darkspawn swarm in every direction. The sheep have escaped pens. The whole village is aflame, and it’s all her fault. Papa will be so, so angry. Smoke forces her outside, and it takes a minute for Amalia to realize the sheep aren’t the ones bleating terror across the open square. No. It’s the shepherd boy who taught her to swim, it’s her auntie, it’s the baker, it’s the family next door. Maker have mercy, it’s the whole village. So Amalia tears up the hill, unsteady on cobblestones slicked with blood, and straight into the heart of the scariest place she’s ever known: Grandpa Wilhelm’s basement where Papa warned her to never go. Because maybe, just maybe, even the darkspawn will be too scared to follow. She doesn’t stop in the parlor, she doesn’t stop in the library, she doesn’t stop in the cellar, or until she’s thundering down the stairs to the lowest level, into the farthest corner, the darkest shadow, because maybe, just maybe, they won’t find her like they found the shepherd boy. Though to her ears, it sounds like they’re trying. Amalia presses one hand over her mouth, then the other, choking back the sound of her crying. She can’t stop shaking, and she can’t stop seeing everything she saw. And then there’s something warm and soft brushing against her leg, a wet nose bumping up under her chin, and a purr that rumbles louder than the darkspawn upstairs. “Oh, Kitty,” she sobs, and no demon has ever been more glad of a name. Amalia clutches the orange tabby to her chest and simply weeps. She’s delirious, hiccupping with terror as she babbles out every dreaded thought, every fear, every hope she thinks she’s lost. Kitty nuzzles her cheek and licks away the tears until she can’t help laughing, a sound it has never heard before but wants to hear again. It dips into her mind, holding wonder: what is a cookie? Kitty has never seen the waking world beyond the basement walls, but this little thing has seen it all: a field, and a lake, and a forest; the sun, the moon, and the stars. And cookies! Candy, and Wintersend songs. Not echoed across the Veil, but real. Real. It curls up in Amelia’s lap when she falls asleep, and it is enchanted by the slow rise and fall of her chest, the steady beat of her little heart—the bright, clean pool of her mana that makes it want to drink, and drink, and drink. It never knew humans could be so small or vulnerable or innocent; Wilhelm was large and powerful and cruel. She changes everything; there will be no returning to the Fade. Wherever Amalia goes, Kitty will follow. Whoever Momma is, Kitty will find her. Whenever templars come, Kitty will stop them. Whatever happens, Papa must never know. Hours later, Amalia wakes with a start. Beloved to a human girl. It is dizzy with joy, and the realization brims with promise, purpose. If it keeps Amalia safe, it need never be alone.